This might sound counterintuitive, but the smaller, the tighter your target audience is, the better. If you are trying to advertise and market to everybody, you have a lot of people to reach, but little to no impact because it doesn’t talk to somebody closely. Do you specialize in a particular area? Do you have a particular kind of client that you work for? Is there something in your expertise which is different from most people? At the very least, if you’re going out on your own, as opposed to working for somebody else, think about why you left whoever you worked for. Not necessarily something wrong – but something which didn’t work for you. What didn’t you like? What was a different and better priority for yo? And why would that matter to your client? Or .learning and up-skilling – so you can do something yourself rather than paying somebody else to do it. Don’t expect your marketing to come completely free. If it sounds too good to be true, it is. The next few points relate to having a relatively small budget and the need to make it work hard on results. Some brand colors. One, two or maybe three. Understand how to define them precisely and note their values. You can also pick some shades or tints of those colours you’ll use when you need a lighter background. Probably a standard font and perhaps a little bit of a layout. How much should that cost? You can go to a designer. (If you want some referrals, ask me, I know a couple of great and affordable designers.) Or, do a logo contest online. There’s a list of sites here that you can use to get a logo contest going, I haven’t tried all of them. Give it a go, see what happens. You don’t need a fancy website that nobody comes to. All you require is a simple website that says what you do and provides a call for action. That makes it easier to have a bit of money left over to help drive traffic towards that website. That’s a basic list to start. You can add a resource that’s useful for your target customer. They can download it in exchange for you getting their email address. That’s brilliant. One last thing, make your phone number and your email visible near the top of the page. Then people can see straight away how to get hold of you. Start off by working out the size of your budget. Then plan the best way to spend that money. Unfortunately, they’re selling you what they have to sell, not what is best for your business. Make sure you’re the one deciding what types of marketing are best for your business. Have a look at it, see which ones work for you but make sure you decide what you’re going to do. It will take time. Some marketing channels deliver results quickly, others take a lot longer. The simple and obvious example here is Google Adwords vs Search Engine Optimisation. If you want leads online quickly, pay-per-click marketing is a really good place to start. It costs some money but things happen quickly. So pick channels that are going to work in the kind of timeline you need. For ones that are going to take longer, start them now but don’t expect them to happen quickly. Marketing is a learning process. (That’s one of the reasons it takes time.) It’s also why you need to track because then you can adjust. You will inevitably find that some of the channels you thought were going to work, don’t. Some of the ones that you thought, perhaps, weren’t going to work so well, do a bit better. There are some key marketing KPIs you really need to be tracking right from the beginning. Focus on those, not vanity metrics. It doesn’t matter how much traffic you’ve got coming to your website, it matters how much good traffic you’ve got coming to your website. How many people are converting. What is the cost for every lead that you get? How many of those leads then convert into sales and how does that translate into a cost per sale? What’s the revenue per sale? How many sales do you get per customer and what does that equate to as a lifetime value for the customer? When you’re starting out, you need to go out and see people. You need to introduce yourself to people, you need to talk to people. This will help your marketing in a million ways. Join a business chamber. Join several business chambers! You do this in all sorts of ways. Ask your friends, your relatives, your associates of any description. Anybody that you’re in a group with. Why is email important? Because emailing your own list gives a better response rate than any kind of social media marketing you can do. Your email list is a prize possession. Do all you can to build your email list and to keep it clean. 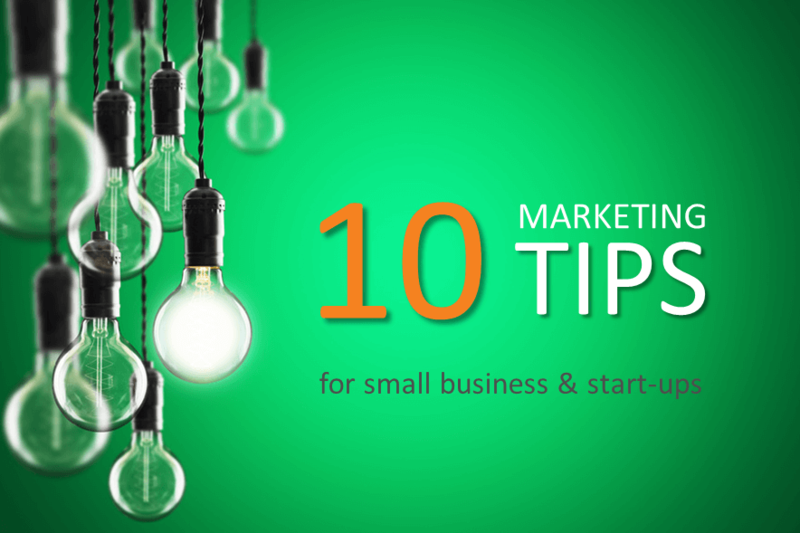 So that’s my 10 marketing tips. They should give you some focus and direction. Good luck.